“Good enough” cheapens the people who create it and the leaders who allow it. Mediocrity degrades, de-energies, and devalues. Exceptional elevates everyone it touches. Mediocrity is a shameful pollutant that belittles by underestimating potential. Confusion regarding strengths on the team. Exceptional is the result of reaching beyond current performance. Don’t drive people to remarkable. Give them a challenge that inspires their hearts. How can you be an irritant against drifting into unremarkable? How can people do what they love? What memory can you create? What will make you proud when this is over? How can you improve your last performance? How can you honor hard work that produces remarkable results? Dedicate yourself to remarkable leadership. What are you doing to hone your leadership skills? Focus on behaviors you can change now, not tomorrow. Do something today that moves toward remarkable. Identify shared values. What guides behavior? Take chances and learn from failure. Caution and coddling prevent excellence. The path to exceptional is paved with failure. If you achieve exceptional on the first try, you’re mediocre. Honor effort while celebrating wins. Don’t allow the path to exceptional to grow dark, angry, or negative. Bring in new blood. They see things you ignore. Remind them of mission, vision, values, and goals or they’re input will distract. Adopt a “do your best now” and a “do better tomorrow” approach. How can leaders address a drift toward mediocrity? What behaviors move organizations toward exceptional? 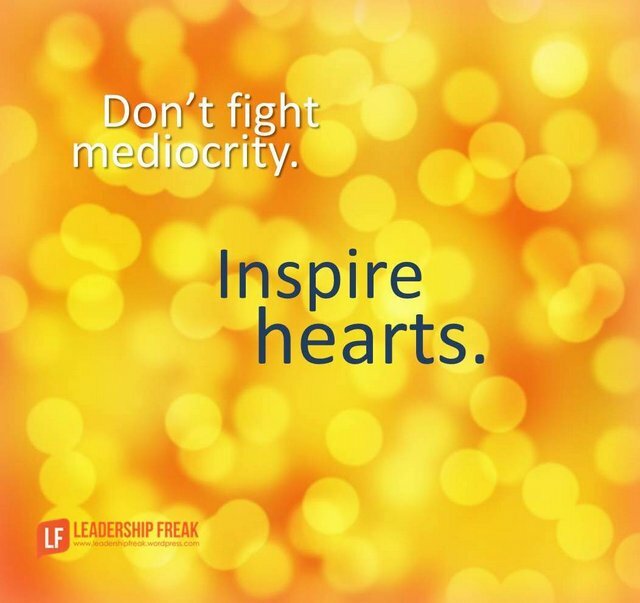 How can leaders address a drift toward mediocrity? 9. Become a feedback machine. Meaningful feedback guides our trajectory. Honing feedback skills is ever the challenge. Thanks Leann. Yes indeed. Research shows that most employees actually want more feedback. Everyone wants to know how they are doing. Drifting toward mediocrity happens because someone allows it! We have to hold individuals accountable for their actions and direct them toward exceptional! Stop saying it’s O.K. if you allow levels tolerance to be manipulated, they will push the envelope every time to become mediocre. Customers and clients are important they must be given what they expect not what we think is acceptable. When in doubt consult the client and correct the actions of yourself and others to create an exceptional project for everyone. Allowing “Drifting” is becoming so prevalent today. Seems society is bent to bland sameness and “mediocrity”, because there is little accountability and “robots” are easier to control. Thanks Tim. We must embrace the idea that intolerance plays an important part in preventing the drift toward mediocrity. Honor effort, lack of focus and confront mediocrity courageously are really powerful suggestions. They ordinary organisations great. Such practices make ordinary managers leaders. But the journey is not so easy. To honor effort, we need mechanism in place. Today, organisations honor numbers. They honor people based on numbers and other important things are kept aside. Just like numbers are part of some mechanism, efforts should be part of same mechanism. And it needs courage to do that. Leaders can address drift toward mediocrity by checking, intervening and aligning. They should intervene and align effort toward goal. It may be common as people may not have much focus. Leaders constantly address the need for focus and aligning effort to achieve goal. I think self example of action, behavior, character and dedication can move people towards goal. Achieving exceptional goal is all about people. Encourage people, align them to bigger picture and keep making their morale up. I think this can achieve even bigger goals. As always Dan, excellent post. I remember a sign in the office of a mid level manager in a bad organization that simply stated “Good Enough Isn’t – – Unknown”. His small sign planted the seed of pursuing more than the minimum in my own career. Happily for him and sadly for the hopelessly hidebound company he was in he moved on and found personal fulfillment and became a difference maker in a company that appreciated reaching higher. Great post, Dan. You wrote about performance and not one use of the subjective term “excellent.” Instead, you came up with two objective, “measurable” terms–remarkable and exceptional–which not only fit in, but stand-out. I believe your post inspires us to SEE (understand) how mediocrity undermines performance and esprit de corps, and why the causes of mediocrity can anchor a staff and organization to betterment. But here’s where real leadership and your QUESTIONS TO REMARKABLE and STEPS TO EXCEPTIONAL can “exorcize” mediocrity. In watching a bit of football this weekend, I was pondering the difference in good coaches and great coaches: The great coaches really show their worth when their team is down and they diagnose the game, and bring their team back to win. I think this post, Dan, speaks to you as a great coach and differentiated from say, an advisor, for example. Advisors lead us to become more proficient in our profession and more knowledgeable in different facets of our life, living, being, and doing. Coaches also have a profound impact on our life, transforming us in ways that go beyond mere management, knowledge and wisdom. In their scopes of influence, it seems there is one difference. It is centered in the heart of the advisor and coach. They both sincerely want us to learn and grow. Coaches, though, passionately want us to outgrow them. I find I have to balance this with the maxim that “perfect is the enemy of good enough”. I’m working to a fixed price. The customer will NOT pay more more “exceptional”, so unless exceptional can be done at the same price as “ordinary”, you have to be careful. If you go an extra mile and build a Rolls Royce but the customer will only pay for a low-end Ford, and you’ll soon run out of funds.Unfortunately! You raise an interesting question- can any organization or team be exceptional? I don’t see ‘exceptional’ as the exclusive domain of high end or high priced products or services, but rather a function of the way a team works together, the way members are appreciated and encouraged to share ideas and to contribute their hearts and souls, in addition to their technical skills. This requires dedicated, effective leadership and a supportive culture, at any price point. Might we think of exceptionalism as standing out for being the best ‘you’ – ( i.e.. the best low priced car, as the case may be), on whatever metric you choose- rather than as being defined as something other than who you are ( or what your product or service is? In this way every organization has the capacity- with the right leadership and culture, to strive toward and even to be exceptional! Lori, I’m constantly having to rein in the tendency to “over-deliver”. We CAN make a better “product” (scientific results in my case), by adding value, strengthening data, providing extra assurance, and because many of my people have a high personal investment in the work they do, the impetus to do that is very strong. Often, unfortunately, the customer wants the barest minimum, and if you could do less, that’s what they want. Customers frequently don’t want the extra, or to have the weaknesses in what they ask for pointed out. Thanks for another great post Dan. I think the reasons for so many mediocre leaders and organizations is captured by your questions you ask in the “remarkable” section. How many leaders have answers to those questions? How many are willing to be an “irritant against drifting into unremarkable”? How many understand what Simon Sinek identified as the key to unlocking engagement and motivation – why? You’ve given us the right questions. It’s up to leaders to answer them. I think if we find each other’s strengths we can all grow the system. Knowing each other’s strengths and weaknesses is vital to any organization. Thank you for these posts that keep us thinking. amazing post, thank you so much!